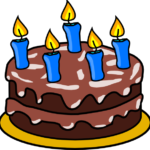 Five years ago today, Colorado LegiSource made its debut as the only known blog written by nonpartisan legislative staff for their legislators and the public. In the years since, we have posted at least one article almost weekly (okay – there have been a few weeks during the legislative sessions that we just couldn’t pull an article together). At this point we have about 172 subscribers and 819 twitter followers. For the last year, we averaged 1,937 views a month and for our entire five-year lifetime, we’ve racked up a total of 78,774 views. We may not have made eBiz’s top 15 most popular blogs list, but we’ve done okay! We have also achieved some recognition along the way. 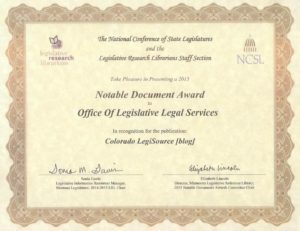 In August 2015, the Colorado LegiSource received an NCSL Notable Documents Award. The Legislative Research Librarians staff section presents these awards annually to recognize excellence in documents that explore topics of interest to legislators and staff and present substantive material in an outstanding format. Also in 2015, the LegiSource article on “Educator Effectiveness and Senate Bill 10-191” was cited in an article on employment law issues published in the October edition of the Colorado Lawyer, a Colorado Bar Association publication. That first day we were anxious to get started. We posted three articles: “The Director’s Welcome,” by Dan Cartin; “The Legislature’s Role in the Review of Administrative Rules,” by Chuck Brackney; and “Bill Requests – Making and keeping the five allowed by rule,” by Patti Dahlberg. Our top five most viewed articles present an interesting mix. The most popular article in the last five years – with 14,893 views – is “Does Colorado Have a ‘Stand Your Ground’ Law?” In this article, Richard Sweetman explained that Colorado does not actually have a “stand your ground law” but it does have a “make my day law.” The difference? Both allow a person to use deadly force to protect himself or herself in certain situations, but Colorado’s law is generally limited to protecting against home invasions and does not include some of the presumptions that are common in “stand your ground” laws. You should read the article. “Powers, Duties, and Functions of Executive Branch Agencies (Type 1, type 2, and type 3 transfers),” by Rebecca Hausmann, rounding out the top five with 1,243 views. The Colorado constitution, such as the single subject requirement and the GAVEL amendment. To this list, we’ve added fun and informative articles about the history of Colorado’s state government and of the state capitol. We hope we’ve lived up to our purpose in the last five years; we hope that our readers have gained as much knowledge, understanding, and enjoyment in the reading as we have in the writing. Happy Birthday, Colorado LegiSource – here’s to the next five years!